Prohibition Cabaret Bar is the home of all things entertainment for performers and audiences alike. Built specifically to provide a stage for variety, cabaret, music hall and vaudeville acts from the region and beyond and fast becoming one of the most sought after venues in town for private hires of all kinds. 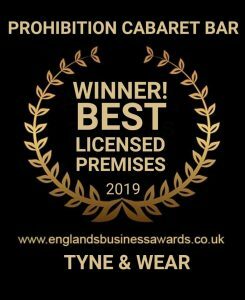 Prohibition has moved to new premises in Newcastle city centre and now boasts an exclusive private hire venue for all kinds of events. The 65 capacity private hire venue features a purpose built cabaret stage, an in house Bose PA system, microphone, private bar, personal doorman to greet your guests, private WC facilities and exclusive use of our private 1930’s F.B.I. Prohibition Bureau with hidden antique billiards table. Ideally located just a stone’s throw from Newcastle Central Station our new premises are within a couple of minutes walk from local, national and international transport links by train, Metro, ferry, bus, taxi, Mobike or on foot. New space available for private hires – ‘The Bureau’ – A mock 1930’s F.B.I. 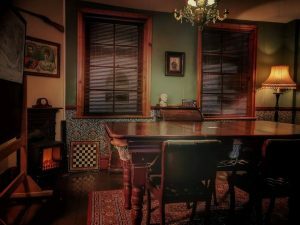 Prohibition Bureau perfect for private gaming, cards, billiards, interviews, D&D, board meetings, appraisals, briefings, script table reads, workshops/sessions/classes, this list is endless. Birthdays over 25 years, anniversaries, wedding receptions, private screenings, networking events, leaving parties, work’s parties, baby showers, naming ceremonies, photoshoots/filming/location hires, dance classes, auditions and so on. Stag and Hen parties attract extra charges, terms and conditions. Contact us for more information. All day hires are charged hourly or as a discounted day rate to cover basic staffing and utilities costs for the use of the space. No more, no less. All evening hires* are FREE however a £50 charge to cover your doorman for the evening is required upfront and will act as your deposit. This is all it costs to secure your booking. There will be no further charges. (*excludes Stag or Hen parties). Your hire will include exclusivity of the venue for the date hired. Evening hires are 7pm – 11pm. Daytime hire hours can be discussed. Access can be permitted from 6pm (free of charge) to decorate / set up / sound check / lay out buffet, etc. Free use of in-house PA system with laptop / MP3 connectivity for personal playlists, or we can play your CD’s too. If you hire a DJ they are welcome to connect to the in-house PA for their set. Free use of a microphone and stand for speeches / performances / talks. Free use of blackboard or projector screen. 65 capacity. Seating / tables for up to 50, remainder standing. Free use of our 8ft x 2ft buffet table (with cloth). Use of purpose built stage and spot-lights. Private Bureau available for smaller meetings (up to 12 delegates) / VIP guests / private billiards sessions, cards or dominoes, etc. Over 18’s only** – Challenge 25 scheme in operation. **Children are permitted to attend evening family functions up to 10pm and any daytime events. For housekeeping purposes Prohibition does NOT allow confetti or glitter decorations or costumes of any variety. Prohibition does not provide catering in house – that means you are welcome to source or bring your own buffet or catering of your own choice. Prohibition does not provide private entertainment – you are welcome to source these yourself, though we can help with contacts if required. Prohibition does not provide drinks packages or entertainment packages. The private hire venue is on the first floor of the premises meaning it unfortunately has no disabled access. For all hire enquiries and date availability please drop us a line below, we look forward to hearing from you! © Prohibition Cabaret Bar 2016. All rights reserved.